When it comes to talent, gender has nothing to do with it. 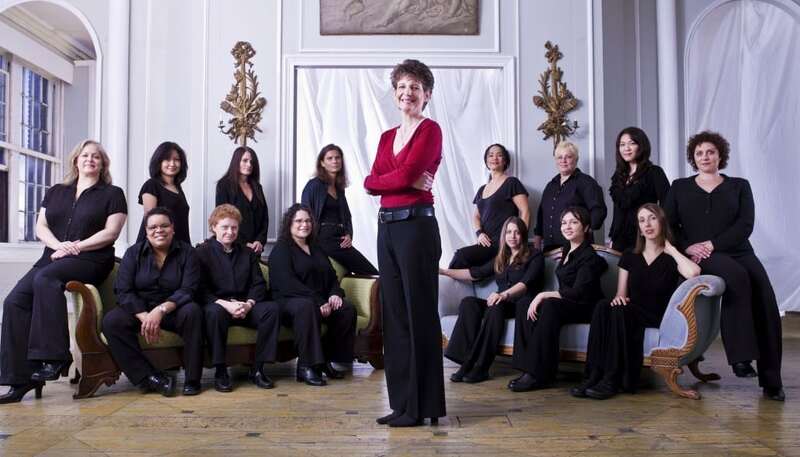 DIVA, the 15-piece all-female jazz orchestra from New York, delivers a jaw-dropping wall of sound that puts many all-male acts to shame. That each ironclad musician looks like she’s having the time of her life at every performance makes for incomparable, swinging and gripping entertainment. DIVA drummer Sherrie Maricle became the first member of DIVA when the band was formed more than 23 years ago by fellow drummer and artist manager Stanley Kay. As Maricle tells it, she was performing in the pick-up orchestra at a Maurice Hines concert that Kay was conducting for the Shubert Theater’s 75th anniversary. After the showA, Kay approached Maricle and “asked if I knew other women who played as well as I did.” Of course, she knew plenty. After an audition bringing in 40 top musicians from all over the world, the group was whittled down to 15 and DIVA was born. Since attending parades as a small child and singling out the drummers as the coolest members of the band because they never stopped playing, Maricle has been drawn to the drums. But “the true enlightenment moment” came when she was 11 and saw Buddy Rich perform with His Killer Force Orchestra. As a bandleader, Maricle has aimed to follow in Rich’s footsteps, as well as those of Mel Lewis, Louis Bellson, Jeff Hamilton, Gene Krupa and Chick Webb. The inspiration goes well beyond the stage. Over the last two decades, Maricle and DIVA artists have provided “life-changing” instruction for dozens of young and up-and-coming musicians and several audience members have experienced such sheer awe at performances that they’ve been brought to tears. “I remember an older woman coming up to us sobbing with joy, saying she always wanted to be a musician, but wasn’t allowed. She just couldn’t believe how great we played. It made me cry, too,” Maricle says. Don’t miss Sherrie Maricle and jazz quintet Five Play at 9 p.m. July 29 in the intimate lounge dinner setting of Cucina at the Lodge at Vail for the Vail Jazz Club Series. The talent pool multiplies into 15-piece jazz orchestra DIVA from 6 to 8 p.m. for Vail Jazz @ Vail Square on Thursday, July 30 in the Vail Jazz Tent in Lionshead. For tickets or more information, visit vailjazz.org or call 888-VAIL-JAM. In 1995 life-long jazz fan Howard Stone launched the inaugural Labor Day Weekend Vail Jazz Party. A resounding success, the Weekend Party spawned the Vail Jazz Foundation, its mission to showcase the talent of prominent and up-and-coming jazz musicians as well as educate and nurture the genre’s next generation of greats. Vail Jazz has grown to include year-round programming such as Vail Jazz Goes to School and 12 weeks of live performances every summer with The Vail Jazz Festival’s Vail Jazz @ Vail Square, Vail Jazz @ The Market, Vail Jazz @ Sweet Basil, Jammin’ Jazz Kids and The Vail Jazz Workshop for a total of 52 live performances and 10 educational programs.